A while ago, to quench and purge me of my waiting anxiety, I created some fan-made covers for The Legion of Flame, the second book in Anthony Ryan's dragon-plagued second franchise, The Draconis Memoria. I pictured it was red, owing to the pattern for primary color-schemed trilogies. But the official cover, which was released just now, blew me away! I praise the art department of Ace and Roc that made the cover better than I expected. I am always delighted to find the publisher's art department step up and surpass their previous works. I mentioned somewhere that I am a sucker for OCD inducing designs and I am inexplicably easily drawn by color blue! 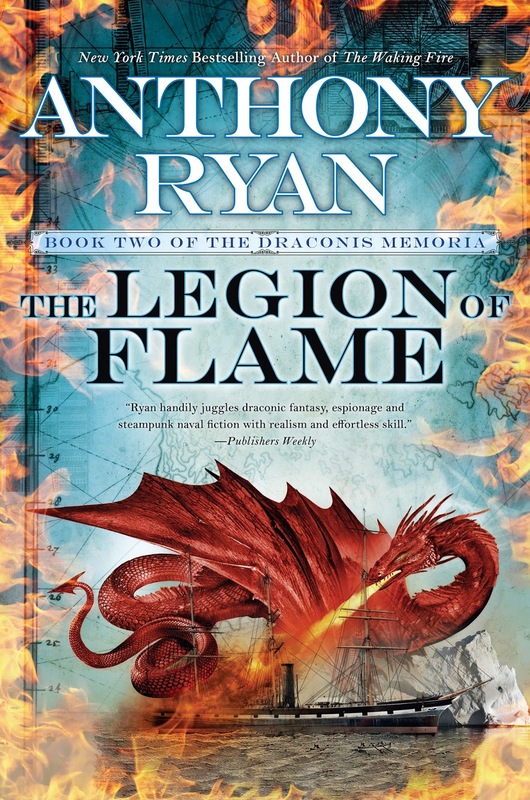 Check out the cover of The Legion of Flame by Anthony Ryan. Empires clash and a fell power stakes its claim in the second in a new series from the New York Times bestselling author of the Raven's Shadow Trilogy. Rogue Blood-blessed Claydon Torcreek, Syndicate agent Lizanne Lethridge, and ironship captain Corrick Hilemore embark upon perilous quests to chase down clues that offer faint hopes of salvation. As the world burns around them, and the fires of revolution are ignited, these few are the last hope for the empire, and all of civilization. The Legion of Flame by Anthony Ryan will be released on June 27, 2017.